Wide range of fibers selections and micron ratings make these cartridges an economical choice for filtration of all types of chemicals, water, vegetable and petroleum oils, solvents. Melt blown fiber depth filters are economical and offer superior filtration efficiency in range of micron ratings from 1 micron absolute to 70 micron high efficiency designs in filtration efficiency ratings from 1 – 20 micron absolute. 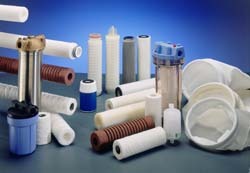 Economical designs in filtration efficiency ratings from 1 – 100 microns nominal.